I read Kottke’s post and his follow-up last week and the question he asks has been ratting around in my brain ever since. Is Facebook the new AOL? 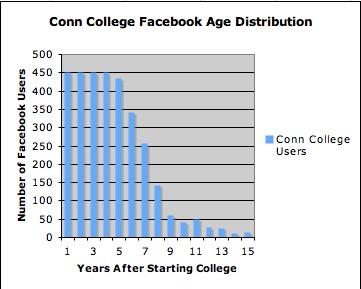 But, the bigger issue with Facebook to me is the reliance on the college market. I know they’ve opened up membership recently, but their user base is predominantly still college kids (and the TechCrunch crowd). Jarid runs a web-based business that targets a different sector than the college crowd so he is thinking about this through his lens, which we all do. It got me thinking. I had seen so many of my friends jump onto Facebook recently that I naively assumed it was gaining critical mass among the older crowd. Does anyone use facebook other than 15 to 25 year olds and the techcrunch 50,000? And I got a hit. Rick Stratton sent me this data on his college, Connecticut College. So that got me thinking that MIT might be a good network to look at. Being that it’s my own college network, I did just that. 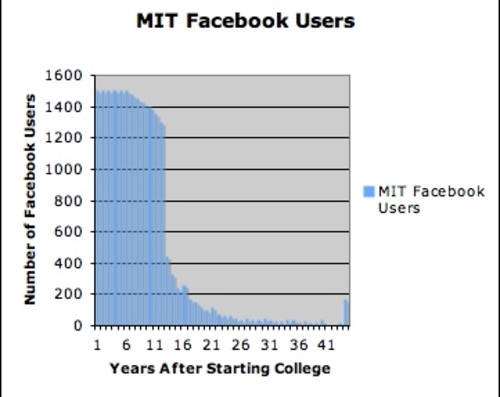 And here are the stats for MIT, going all the way out to 60 year olds. That peak at the very end of the tail is the 61 years and older group. And it’s not entirely accurate as a number of Facebook users like to claim they are 90 years old and such. What both of these charts show is that Jarid is right. Facebook is still predominantly a 15 to 26 year old service. The usage drops off dramatically once people get above 30 years old (26 years old in the case of Connecticut College). This will be an interesting data set to come back to in six months time, a year’s time, and so on. We’ll see if Facebook can move beyond the Techcrunch 50,000 into the mainstream among the older crowd. One thing they have going for them is it appears once you are on Facebook, you don’t leave. So time will start to move those numbers up on its own.